The first Ampersand apprenticeship is complete! So much has happened in these last six months and the apprenticeship has woven through everything. But there are a couple of things I really need to say. First of all, Janus Herrera is a great role model for directing one’s own path of self-education. If you want to learn more about living sustainably and gain more hands-on skills, there are programs out there. Classes, internships, programs you pay for- and with good reason. It takes a lot of time and effort to offer an educational program. I know, of course, because I’ve been doing this at Ampersand for some time. But there is another valuable item of exchange not to be overlooked. It’s your own attention, dedication, and elbow grease. We would not have offered the apprenticeship at all without Janus’s request to get more involved in Ampersand. She offered her interest and some consistent help. She had already proved her responsibility and dedication during the time she spent in an Ampersand work-trade position during October of 2016, when she lived on site for three weeks. Because I knew she was the kind of person who would honor an agreement, communicate about her needs, and dive into whatever task was scheduled for the day, we created this apprenticeship opportunity. Her ability to pull off an amazing ensemble from the costume box for Halloween was duly noted. Our main project over the winter was to erect a hoop house and outfit it as a propagation environment. We called it a Greenhouse Apprenticeship, and it culminated with our two Spring Fundraiser Plant Sales. 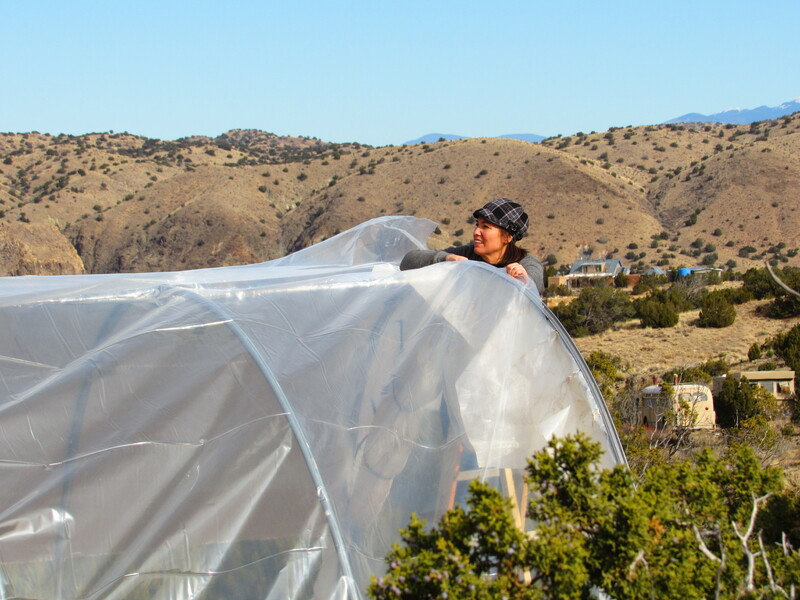 From November to May, our weekly work days progressed from getting the hoop house up, to making propagation tables, painting water tanks and installing gutters, planting and transplanting, and tending to the plants in the mature greywater greenhouse. We now have three different greenhouse spaces that have different ranges of temperatures and qualities of light. Turns out there is a lot we can learn from it all. Anyone who knows me, knows I’m a plant person. After falling in and out of love with farming in my younger years, and settling for a life of rainwater supply, I’m surprised now to re-discover myself as a teacher in the realm of quantity plant production (quality goes without saying). I’ve been overjoyed as well as a bit overwhelmed. And so grateful for Janus’s dependable and intelligent help. Her participation has definitely been crucial to the success we have had with the plant sales. Meanwhile, on other days of the week Janus was out following her path of self-education wherever it led her. 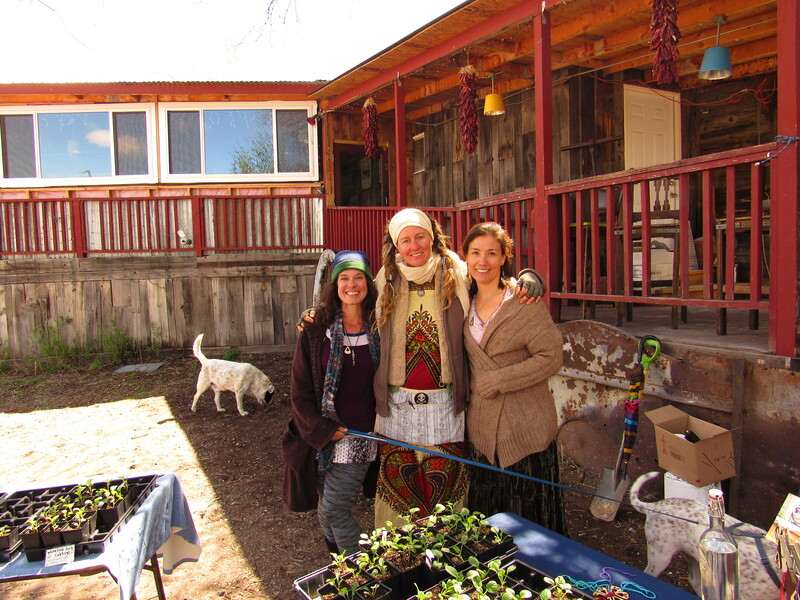 She volunteered at the NM Organic Farming Conference. 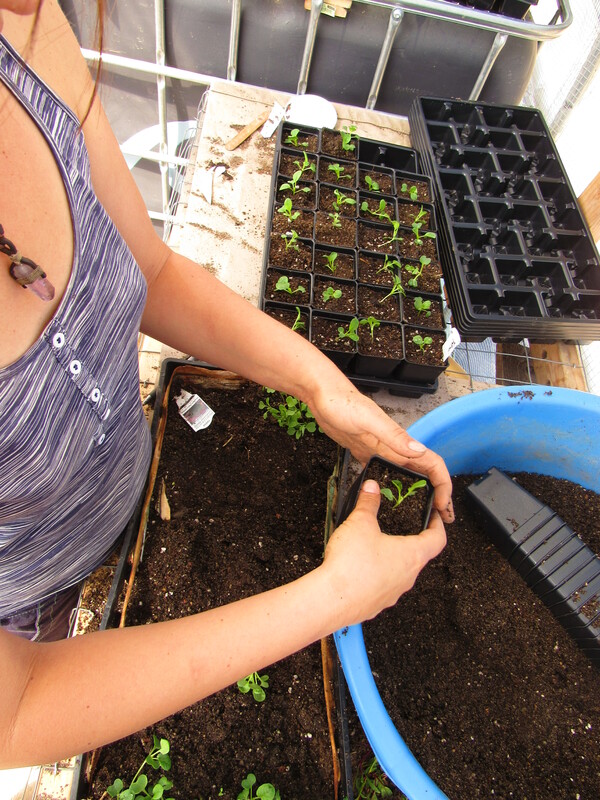 She attended a Veteran Farmers Project workshop, and volunteered with the Albuquerque Library Seed Savers group. She was also taking a welding course which she now helps instruct. Many Fridays Janus would show up at Ampersand full of information she had learned, wanting to talk about it. We all benefited from this dialogue and outside inspiration. Janus has already had a career as a process engineer. She quit that job of security and surety of days spent indoors, wanting to be closer to the Earth. She has a drive to be in service, and that guides her life’s path. She needed a bit of free time, but not much money to navigate her own education in a world she discovered full of teachers and learning opportunities. An attitude of service and desire to connect opens many doors. When someone demonstrates a dedication to a project or place, they inevitably reap rewards. Relationship is everything. Janus expressed her apprenticeship experience as being about relationship as well. The haiku poem above was inspired by one of countless memorable experiences at Ampersand in the six months of my Apprenticeship there. On that Friday we worked together, Amanda, Grace, Ren, and I, emptying myceliated grain from Pleurotus Ostreatus into large tubs where the fungus will soon fruit with tender oyster mushrooms. Amanda expertly instructed us to layer the mycelia with growing medium of coffee grounds and recycled cardboard, alternating layers. We laughed riotously, eating chunks of the clumpy, nutritious harvest with our hands. I had watched the thread-like hyphae spread over several weeks inside their delicate ecosystem – a sterile mason jar that Andy had inoculated with liquid spores. Now checking on our progress, Andy invited us up the hill to view the mycelia under a microscope as he captured the images on his laptop. Did someone inform these beautiful people that I have been fascinated by the magical medicine of mycology for years? Adjusting the focus of the image, it appeared as though we were traveling deeper into the microscopic network; it was a complex, three-dimensional web. I was completely entranced. It is a wonderful challenge to try to distill the essence of Ampersand into a few sentences – I hope I have captured a snapshot of the delightful enrichment that Amanda and Andy were so generous to share with me! The web-like growth of the mycelium in this passage describes the network of relationships that we must grow to create a resilient and regenerative world. The synchronicity that unfolds is not really too mysterious – it emerges from planting one’s care and offering one’s service. Thanks Janus for this reminder and blessings on your next adventure! 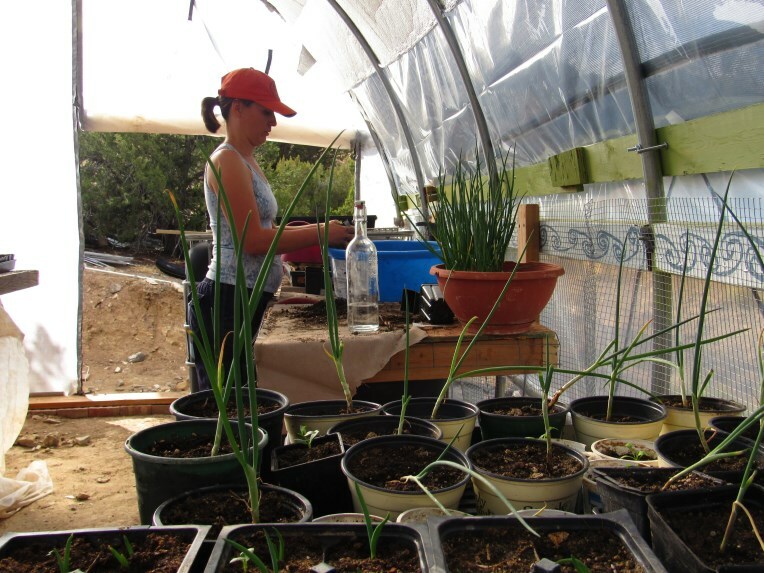 Tags: apprenticeship, DIY, new mexico, organic gardening, plant nursery, rainwater, seedlings, service, sustainability | Permalink.